When asparagus is on sale at Trader Joe's right before Easter you stock up and figure out what to do with it later. Oh, that's not what you do? I guess it's just me. I figured I could do a lot with asparagus, from adding it to an omelet or frittata to roasting it and serving along side some chicken or beef. I knew I would use it, I just didn't quite now how. After a quick inventory check of fridge and freezer, I realized I had everything I needed to make a savory asparagus prosciutto tart. The perfect Spring brunch dish! Start by blanching the asparagus by dumping the trimmed asparagus in boiling water for a few minutes then transferring to an ice bath. The asparagus will turn bright green and be slightly tender. Prepare the puff pastry by creating a 1/2 inch border and poking holes with the tines of a fork in the center then bake until it's slightly golden. While the puff pastry is puffing up in the oven, make the filling. Mix together marscarpone cheese, sour cream, and egg, shallot, lemon zest, parsley, and Parmesan cheese. Take the puff pastry out of the oven and if you see that your puff pastry has been stubborn and puffed up even where you poked holes, press it down with the back of a spoon. Spread the marscarpone mixture into the cavity that you created, leaving the border untouched. On top, add a thin layer of prosciutto. If you really like prosciutto, knock yourself out and add more than one thin layer. Top that with the asparagus and even more Parmesan, because this thing needs more cheese. Once the puff pastry is nice and golden brown and the asparagus is tender and slightly roasted, it is done! I topped mine with a little bit more lemon zest and parsley. And if you read last weeks post, you know I also topped this with some creamy hollandaise sauce! The perfect condiment to go with asparagus! 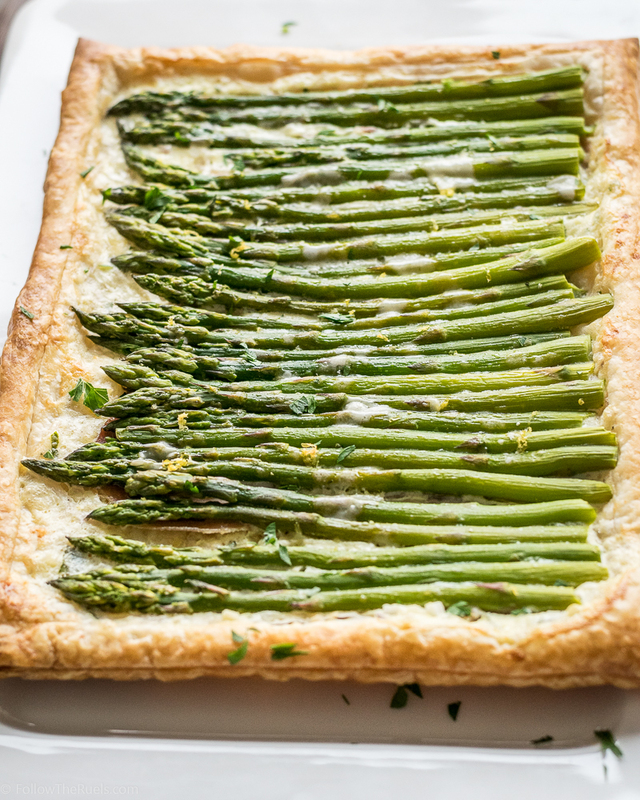 If you are an asparagus lover like me, then you will find absolutely no fault with this asparagus prosciutto tart. It was absolutely delicious and the perfect brunch for Easter! It would also be great for Mother's Day! Trim asparagus by bending them until the break. They will beak at their natural trimming point. Bring a pot of water to a boil. Meanwhile prepare an ice bath. Drop asparagus into boiling water. Boil for 2-3 minutes, until asparagus turns bright green and is slightly tender. Transfer to ice bath. 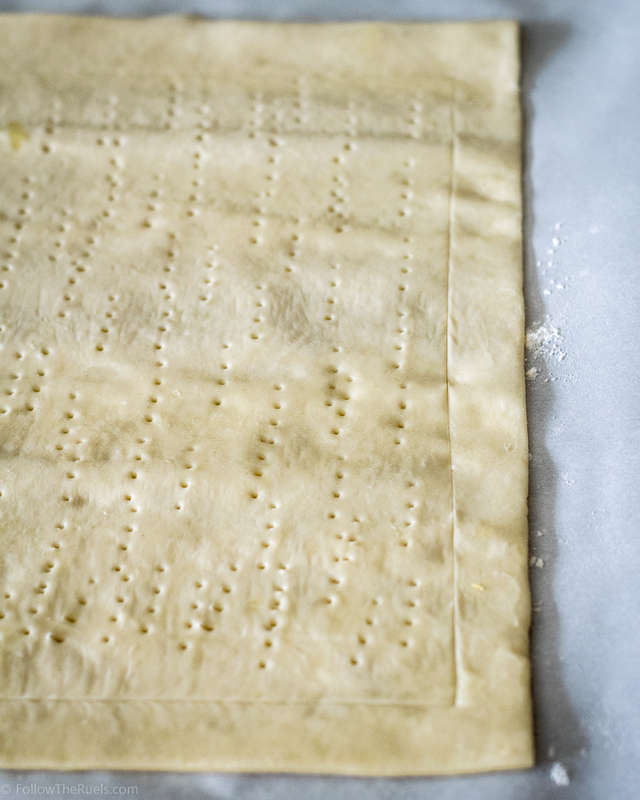 Prepare the puff pastry by cutting a 1/2 inch border and poking holes in the center with a fork. Bake in a 400 degree oven for 10 to 12 minutes, until just barely starting to brown. Meanwhile, cream together the marscarpone cheese, sour cream, and egg in a medium bowl. Add in the shallot, lemon zest, Parmesan, salt, and pepper. Remove puff pastry from the oven and press down the center. Spread the marscarpone mixture over the center of the pastry. Add a layer of prosciutto on top, then top off with the asparagus spears. 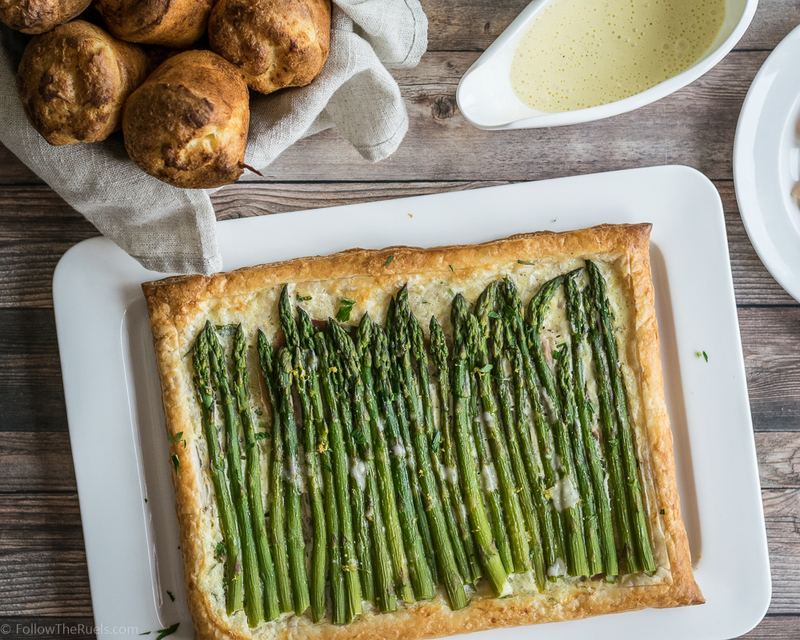 Sprinkle with some additional Parmesan and brush the border of the pastry with an egg wash.
Bake at 400 degrees for another 10 to 15 minutes until the border is golden brown and the asparagus is tender.